A cinematic masterpiece by Jean-Léon Gérôme will lead Sotheby’s annual Orientalist Sale in London on April 30. Rider and His Steed in the Desert is a unique work in Gérôme’s oeuvre. Dating to 1872 this highly charged picture captures both the stoicism of the North African tribespeople and a heroic struggle between man and nature. Estimated at £1-1.5 million the oil is one of five works by Gérôme in a sale comprising 79 paintings, watercolours and sculptures that together offer fascinating historical insights into the Arab, Ottoman, and Islamic worlds during the 19th and early 20th centuries. 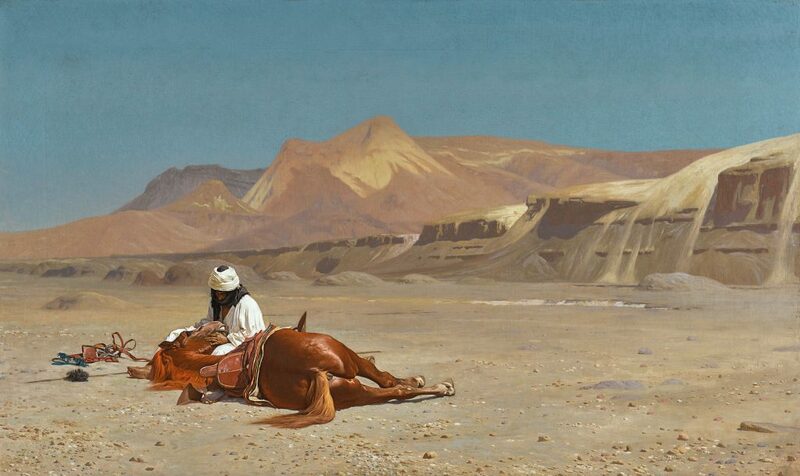 Claude Piening, Sotheby’s Head of Orientalist Paintings remarked: Rider and his Steed, the highlight of the sale, is an especially powerful and emotional image of a moment of tenderness between man and beast against the backdrop of the sun-drenched desert. Cinematic in its conception even before the medium of film existed, with its wide-angle perspective and bright luminosity, the viewer is drawn into the scene which engages our imagination and our empathy.